Green buildings, self-driving cars, and a model set by a Nigerian noodle company were among the topics discussed by the panel. From left: Diane Davis, Christian Irmisch, John Fernández, Efosa Ojomo, Harriet Tregoning, and John Macomber. 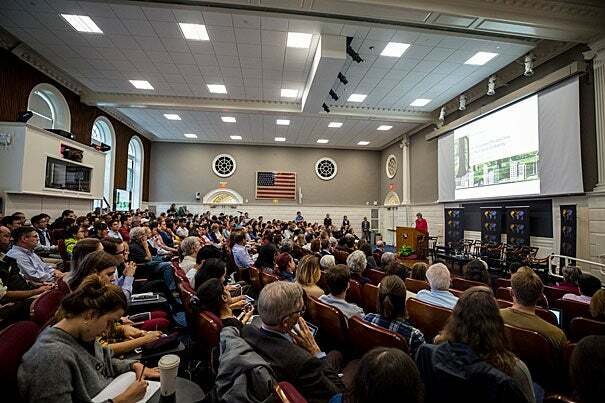 Worldwide Week at Harvard continued Wednesday with a conversation at Longfellow Hall on the future of cities. The panel, which included members of the design, planning, technology, and economic communities, took a broad approach, tackling a variety of issues facing urban leaders. Diane Davis, Charles Dyer Norton Professor of Regional Development and Urbanism and chair of the Department of Urban Planning and Design at the Graduate School of Design, began by looking at the limitations of city planning. Climate change, for example, is affecting urban growth. However, “environmental problems know no boundaries” and require resources that few municipalities can provide without help, she said. The rapid-fire growth of technology — and the shift of cities from industrial to information centers — also must factor into planning, she said. As the discussion began in earnest, panelists addressed more specific issues, drawing on their areas of expertise. Christian Irmisch, sales manager for commuter and regional trains for Siemens, talked about transportation. Irmisch, who holds a degree in electrical engineering from the Institute of Technology in Karlsruhe, Germany, acknowledged that while “trains are the most efficient use of mass transit in cities,” building a railway is a long-term investment, and new technologies may offer more viable alternatives. Presenting figures that cities “consume” from a bare minimum of three to five tons of resources per capita annually to 150 tons, he illustrated the challenges ahead. The numbers are especially troubling when compared with the two to three tons consumed in agricultural areas, he said. Harriet Tregoning, formerly of the U.S. Department of Housing and Urban Development, addressed the role that government can play in supporting efforts like those Ojomo described. As a case study, she brought up HUD’s National Disaster Resilience Competition, which offered $1 billion in disaster relief. The key, she explained, was not to solicit one answer — or any answers at all, at first. Instead, her office encouraged participants to find partners and to examine the distinct threats their municipalities might face, from climate change to overreliance on one employer. Stefan Knupfer, a senior partner and sustainability expert at the consulting firm McKinsey, brought the conversation back to mobility and transit. Directly addressing climate change, he welcomed the rise of self-driving cars, predicting that the new technology would make cities cleaner, safer, and less congested. Framed by photos set up for the event, Summon Chaudhury (left) and Julie Rioux attend the global health forum at the T.H. Chan School.